Why Choose Paddle Gates to Control Pedestrian Access? Paddle gates are a simple but effective way to restrict access at a point of entry such as a business office reception or public toilet. This is beneficial for many reasons, such as improving security, improving safety, collecting information on the number of users entering your building or to aid the prevention of users avoiding paying for entry. Paddle gate systems come in a variety of models to fit the required size, purpose, and robustness of different buildings or areas. 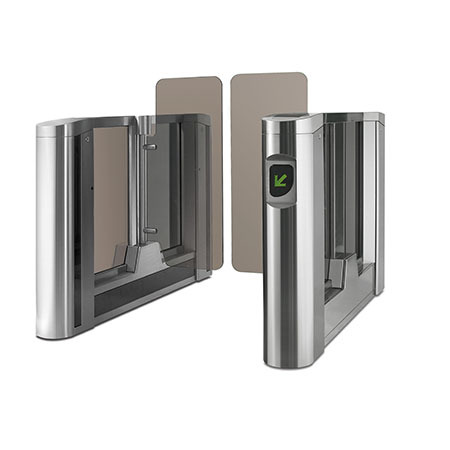 More sophisticated gates can be integrated with card readers, fingerprint readers or cameras, automatically restricting access to only those who have the required permissions. Alternatively, access can be operated manually, e.g. a receptionist allowing entry after clarifying identity. In publicly accessible areas where pedestrian traffic volume is high paddle gates are able to withstand the crush of crowds and still perform effectively. Their sleek design is corrosion proof and gates can be installed beside each other to create narrow entryways, restricting access to a single person at a time. By installing multiple gates in a row you can effectively control crowd movement in or out of your building with the option to restrict lanes to only entry or exit, or both directions, depending on your requirements. For businesses that into keep an eye on number of users, some gates are sophisticated enough to help collect data on the number of users. Do You Want to Collect Cash at Entry? Paddle gates can also save your business time and money by automating the process of cash collection and access control. By integrating your paddle gate systems with a cash collection mechanism or ID/smart card reader pedestrians will not be able to access beyond the gates until they have paid to do so, or have scanned their ID card or ticket. You have probably come access such systems located in train stations. If you are installing a pedestrian access gate you will want a reliable system which doesn't require a lot of time spent on maintenance or repair. In part, this is dependent on the system you have chosen, however will also depend on how professionally the system has been installed and the level of aftercare or warranty you have. By working with a leading gate installer, like Ursa Gates, you can ensure that your security systems are installed correctly initially and any maintenance or repair is quick, easy and hassle-free. Besides security paddle gates can also be used to ensure that the number of people entering an area is controlled to improve safety. These kinds of gates have a number of inbuilt safety features designed to withstand the force of a crowd and ensure that people are not trapped within the gates. Such safety features include: free access should there be no power and ensuring entry points close only when the pedestrian has crossed over. Paddle gates include a mechanism that allows the gates to sense when a user is situated in the path of the gates, so that the gates do not close immediately. Why Choose Ursa Gates to Install Paddle Gates at Your Premises? There are plenty of reasons to choose paddle gates as a way to control access to your building, some of which are detailed above. In addition to purchasing the best product, it is also important that the installation is cost effective and hassle free and should ideally be undertaken by people with the correct expertise. Ursa Gates brings over 25 years' of expertise in installation of access systems and handle diverse requirements ranging from turnstiles, parking systems, traffic barriers and bollards. It is our knowledge and experience which has helped us build our reputation as a professional and reliable supplier and installer. For more information or to speak to someone about installing paddle gates at your premises, contact us today on: 0800 566 8174.